A few months ago we were terrified to hear that Fr Alexei Aedo Villugron of the ROCOR mission in Chile was in a very difficult financial situation. He couldn’t even pay for heating and water during the winter months in South America. The problem was that Fr Alexei is having a hard time finding a regular job, despite having a Ph.D. So he asked us to support him for two years, after which he is confident that he will be able to make ends meet himself. 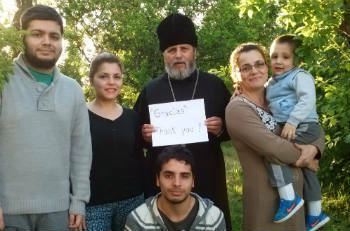 Thanks to you, we have collected even more than we hoped, and Fr Alexei is doing much better without the constant stress of wondering where the family’s next meal is coming from. Thank you so much for supporting our clergy in need!